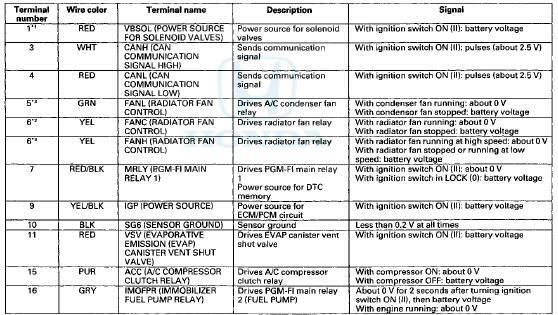 The functions of the fuel and emission control systems are managed by the engine control module (ECM) on vehicles with manual transmissions or the powertrain control module (PCM) on vehicles with automatic transmissions. The ECM/PCM detects the failure of a signal from a sensor or from another control unit and stores a Pending DTC or a Confirmed DTC. Depending on the failure, a Confirmed DTC is stored in either the first or the second drive cycle. When a Confirmed DTC is stored, the ECM/PCM turns on the malfunction indicator lamp (MIL) by a signal sent to the gauge via F-CAN. When an abnormality occurs in the signal from a sensor or from another control unit, the ECM/PCM stores a Confirmed DTC and turns on the MIL immediately. When an abnormality occurs in the signal from a sensor or from another control unit in the first drive cycle, the ECM/PCM stores a Pending DTC. The MIL does not come on at this time. 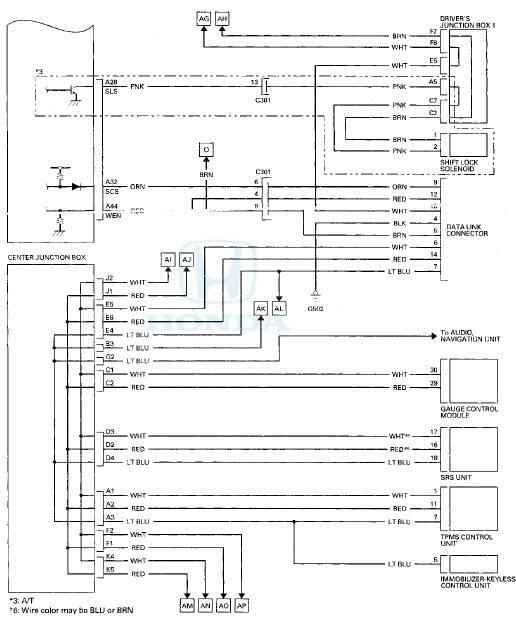 If the failure continues in the second drive cycle, the ECM/PCM stores a Confirmed DTC and turns on the MIL. 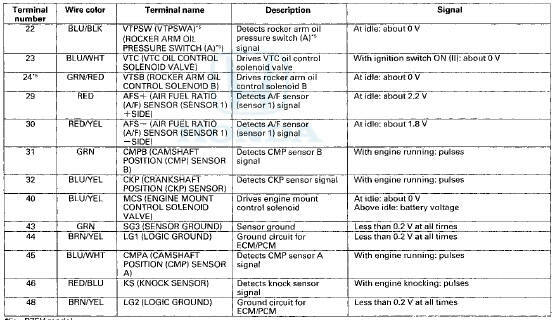 When an abnormality occurs in the signal from a sensor or from another control unit, the ECM/PCM ignores that signal and substitutes a pre-programmed value for them that allows the engine to continue running. This causes a Confirmed DTC to be stored and the MIL to come on. 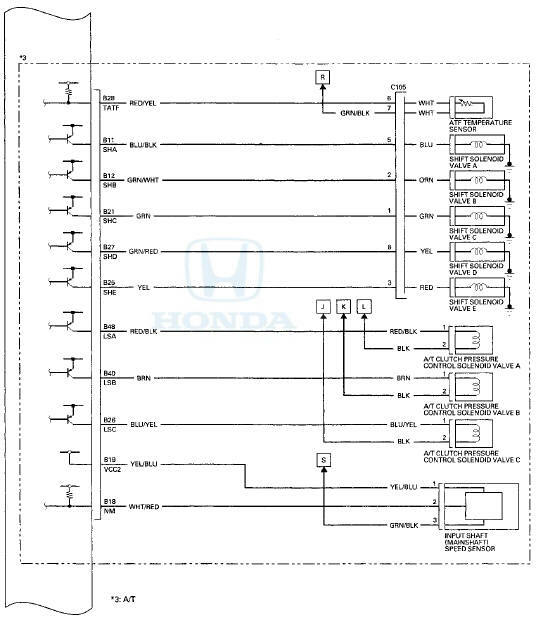 When the ignition switch is turned to ON (II), the ECM/PCM turns on the MIL via the F-CAN circuit for about 15 to 20 seconds to check the bulb condition. If any readiness codes are not set to complete, the MIL flashes five times. If all readiness codes are set to complete, the MIL goes off. 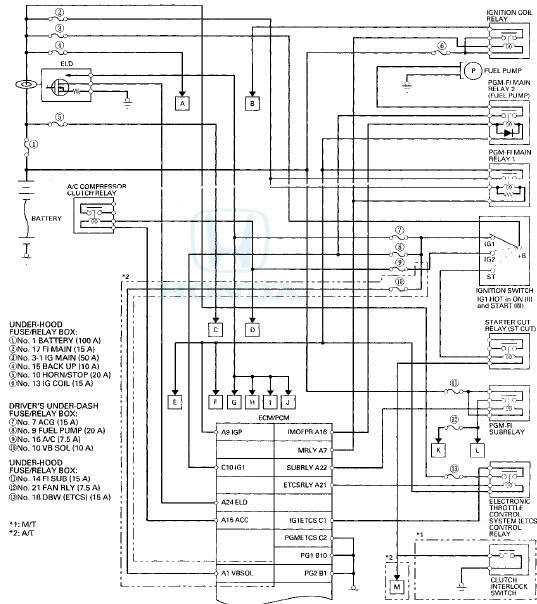 After the ignition switch is turned to LOCK (0), the ECM/PCM stays on (about 40 minutes). 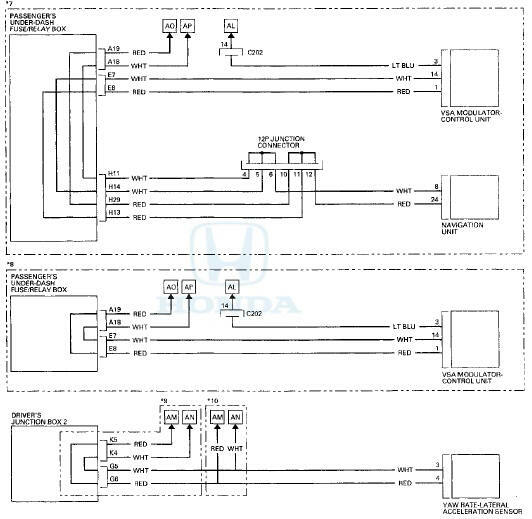 If the ECM/PCM connector is disconnected during this time, the ECM/PCM may be damaged. 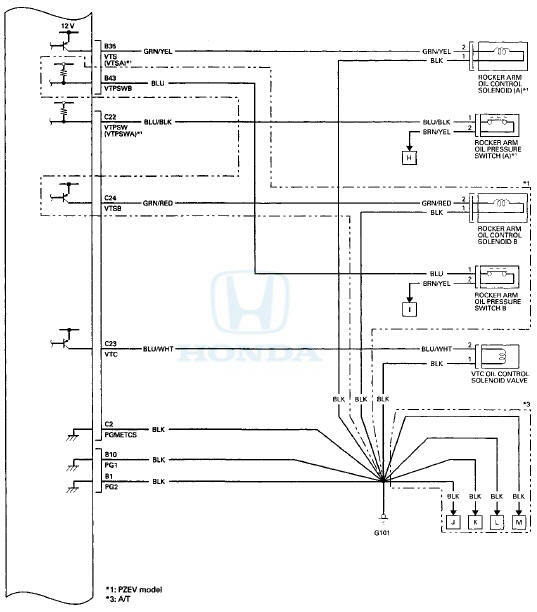 To cancel this mode, disconnect the negative cable from the battery or jump the SCS line with the HDS after the ignition switch is turned to LOCK (0). 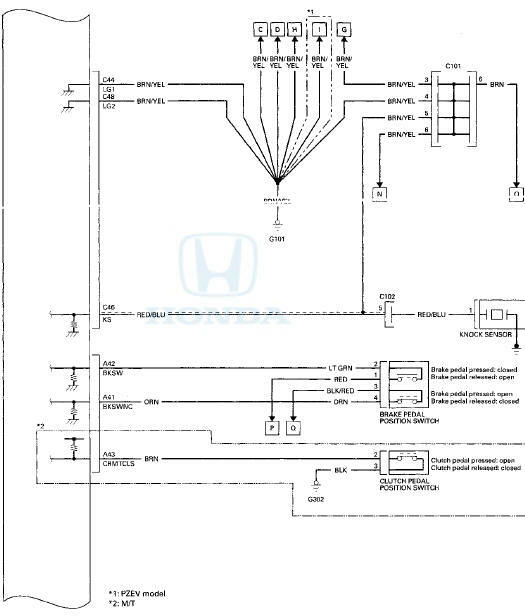 The programmed fuel injection (PGM-FI) system is a sequential multiport fuel injection system. The alternator signals the ECM/PCM during charging. 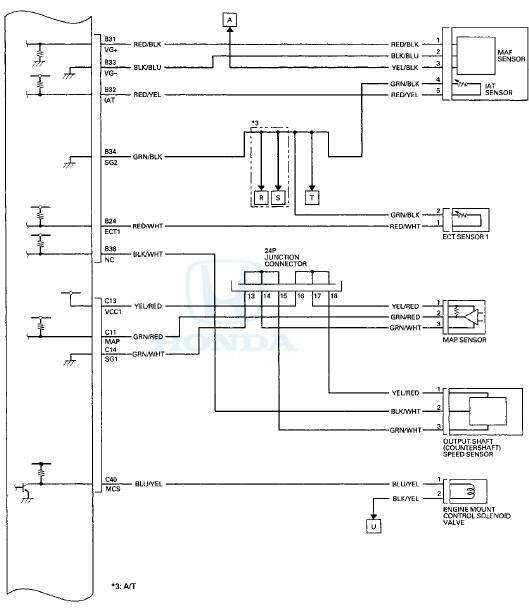 The ECM/PCM then controls the voltage generated at the alternator according to the electrical load determined by the electrical load detector (ELD) and the driving mode. This reduces engine load to improve fuel economy. When the ECM/PCM receives a demand for cooling from the A/C system, it delays the compressor from being energized, and enriches the mixture to assure a smooth transition to the A/C mode. The A/F sensor operates over a wide air/fuel range. 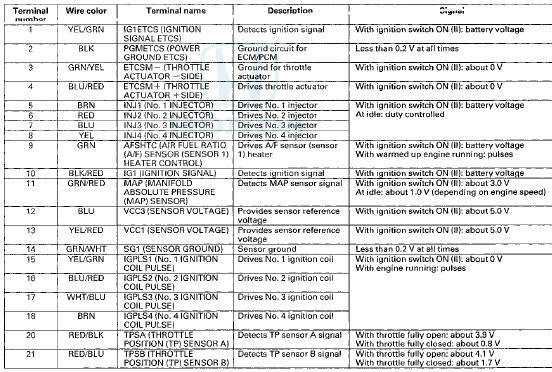 The A/F sensor is installed upstream of the WU-TWC, and sends signals to the ECM/PCM which varies the duration of fuel injection accordingly. The BARO sensor is inside the ECM/PCM. It converts atmospheric pressure into a voltage signal that is used by the ECM/PCM to modify the basic duration of the fuel injection discharge. The CMP sensor B detects the position of the No. 1 cylinder as a reference for sequential fuel injection to each cylinder. The CKP sensor detects crankshaft speed, and is used by the ECM/PCM to determine ignition timing, timing for the fuel injection of each cylinder, and engine misfire detection. ECT sensors 1 and 2 are temperature dependent resistors (thermistors). The resistance decreases as the engine coolant temperature increases. The ECM/PCM contains the memory for basic ignition timing at various engine speeds and manifold absolute pressures. It also adjusts the timing according to engine coolant temperature and intake air temperature. The ECM/PCM contains the memory for basic discharge duration at various engine speeds and manifold pressures. The basic discharge duration, after being read out from the memory, is further modified by signals sent from various sensors to obtain the final discharge duration. By monitoring long term fuel trim, the ECM/PCM detects long term malfunctions in the fuel system and sets diagnostic trouble codes (DTCs) if needed. The knock control system adjusts the ignition timing to minimize knock. 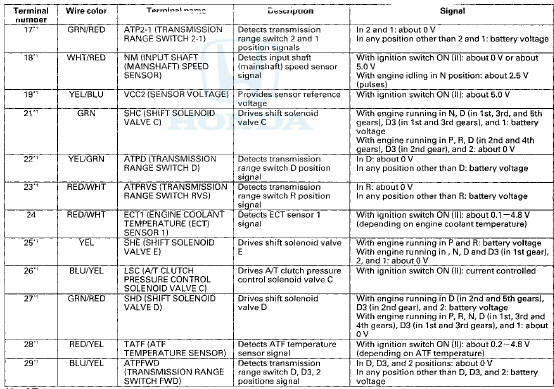 The vehicle has certain readiness codes that are part of the on-board diagnostics for the emissions systems. 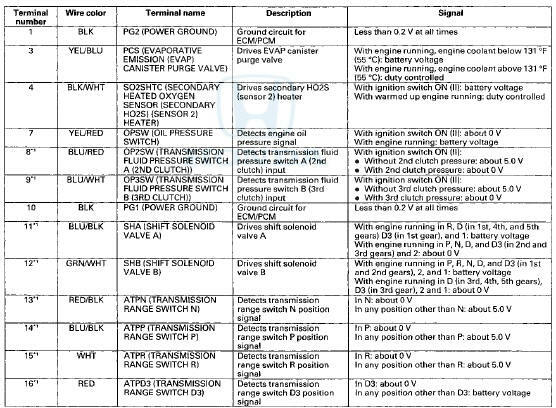 If the vehicle's battery has been disconnected or gone dead, if DTCs have been cleared, or if the ECM/PCM has been reset, these codes are reset. In some states, part of the emissions testing is to make sure these codes are set to complete. If all of them are not set to complete, the vehicle may fail the test, or the test cannot be finished. To check if the readiness codes are set to complete, turn the ignition switch to ON (II), but do not start the engine. The MIL will come on for 15-вЂќ20 seconds. If it then goes off, the readiness codes are complete. If it flashes five times, one or more readiness codes are not complete. 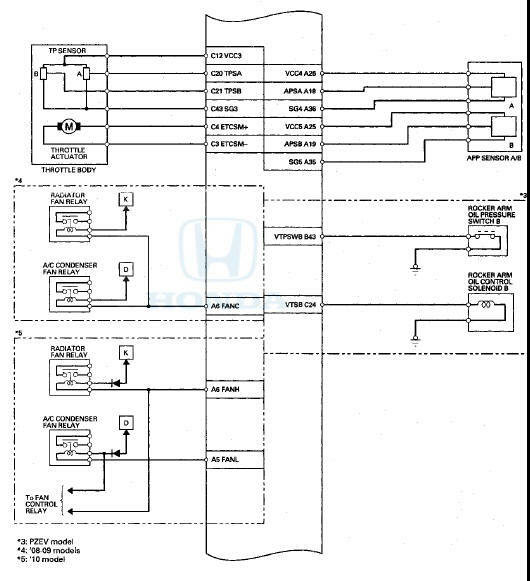 To set each code, drive the vehicle or run the engine as described in the procedures (see page 11-65). The MAP sensor converts manifold absolute pressures Into electrical signals that are sent to the ECM/PCM. The mass air flow (MAF) sensor/intake air temperature (IAT) sensor contains a hot wire sensor, a cold wire sensor and a thermistor. It is in the intake air passage. The resistance of the hot wire sensor, the cold wore sensor and the thermistor changes due to intake air temperature and air flow. The control circuit in the MAF sensor controls the current to keep the hot wire at a set temperature. 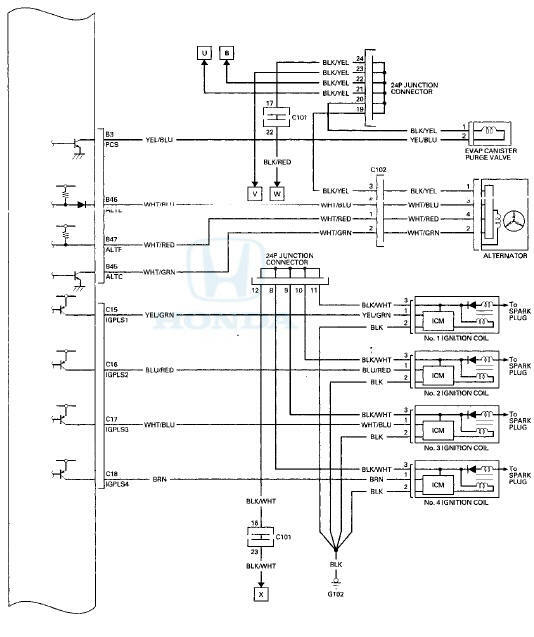 The current is converted to voltage in the control circuit, then output to the ECM/PCM. This sensor detects countershaft speed. The secondary H02S detects the oxygen content in the exhaust gas downstream of the warm up three way catalytic converter (WU-TWC), and sends signals to the ECM/PCM. To stabilize its output, the sensor has an internal heater. The ECM/PCM compares the H02S output with the A/F sensor output to determine catalyst efficiency. A secondary H02S is installed downstream of the WU-TWC. The throttle is electronically controlled. 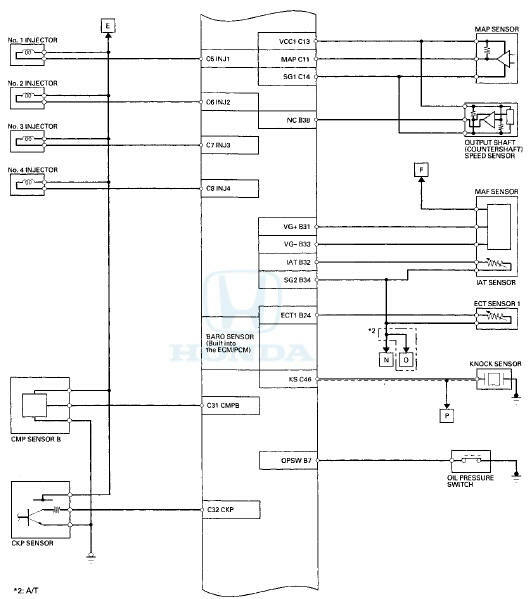 Refer to the system diagram to see a functional layout of the system. Idle control: When the engine is idling, the ECM/PCM controls the throttle actuator to maintain the proper idle speed according to engine loads. 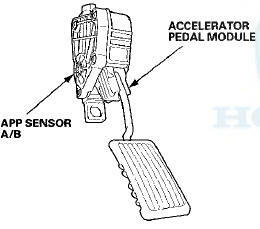 Acceleration control: When the accelerator pedal is pressed, the ECM/PCM opens the throttle valve based on the accelerator pedal position (APP) sensor signal. Cruise control: The ECM/PCM controls the throttle actuator to maintain the set speed when the cruise control is operating. The throttle actuator takes the place of the cruise control actuator. 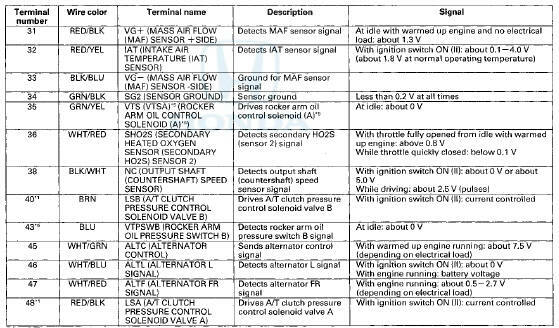 As the accelerator pedal position changes, the sensor varies the signal voltage to the ECM/PCM which then controls the throttle position. The throttle body is a single-barrel side draft type. The lower portion of the throttle valve is heated by engine coolant from the cylinder head to prevent icing of the throttle plate. 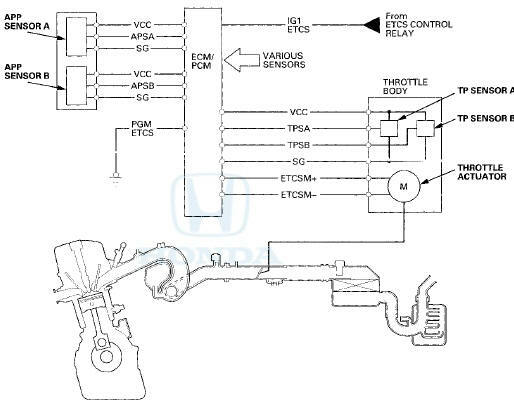 The electronic throttle control system consists of the throttle actuator, throttle position (TP) sensor A/B, accelerator pedal position (APP) sensor A/B, the electronic throttle control system (ETCS) control relay, and the ECM/PCM. 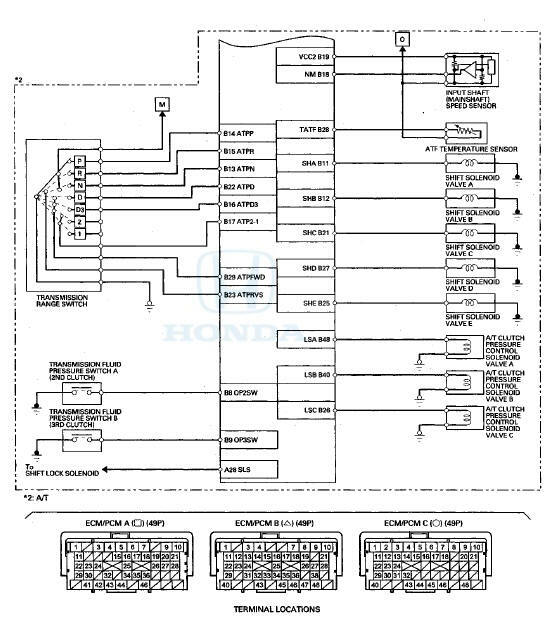 The i-VTEC system has a variable valve timing control (VTC) mechanism on the intake camshaft in addition to the usual VTEC. - This system improves fuel efficiency and reduces exhaust emissions at all levels of engine speed, vehicle speed, and engine load. - The VTEC system changes the intake valve lift and timing by using more than one cam profile. - PZEV model: The VTEC system pauses one side of the exhaust valves in addition to changing the intake valve lift and timing. - The VTC system changes the phase of the intake camshaft via oil pressure. It changes the intake valve timing continuously. The VTC system makes continuous intake valve timing changes based on operating conditions. 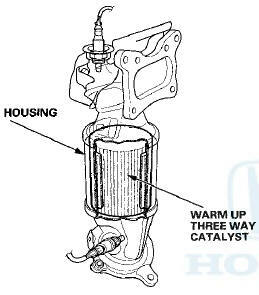 - Intake valve timing is optimized to allow the engine to produce maximum power. - Cam angle is advanced to obtain the EGR effect and reduce pumping loss. The intake valve is closed quickly to reduce the entry of the air/fuel mixture into the intake port and improve the charging effect. - The system reduces the cam advance at idle, stabilizes combustion, and reduces engine speed. - If a malfunction occurs, the VTC system control is disabled and the valve timing is fixed at the fully retarded position. 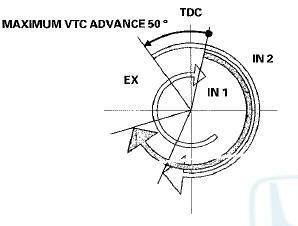 The VTC oil control solenoid valve controls oil pressure to the advance chamber/retard chamber of the VTC actuator according to a signal from the ECM/ PCM. 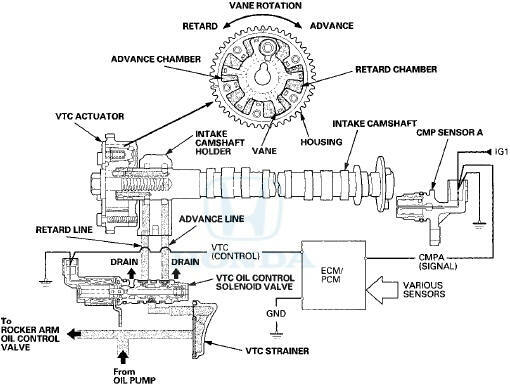 When the VTC actuator vanes rotate to the advance or retard position, the intake camshaft timing is changed. CMP sensor A detects the intake camshaft angle and sends the information to the ECM/PCM. The ECM/PCM controls the VTC oil control solenoid valve as the intake camshaft angle changes. 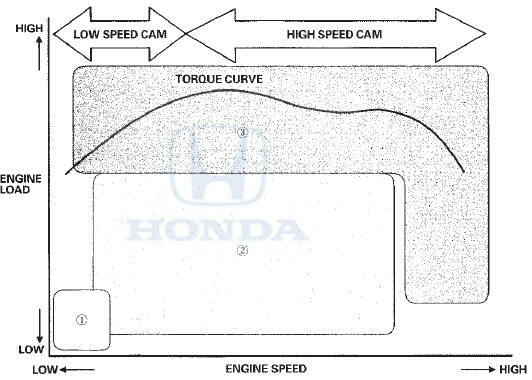 - The VTEC system changes the cam profile to correspond to engine speed. It maximizes torque at low engine speed and output at high engine speed. - The low lift cam is used at low engine speeds, and the high lift cam is used at high engine speeds. 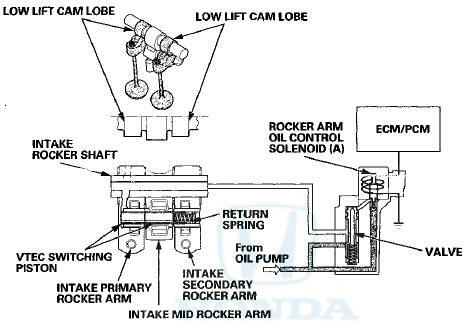 - The rocker arm oil control solenoid (rocker arm oil control solenoid A) switches the intake valve side of the VTEC system on and off; the solenoid is controlled by the ECM/PCM. 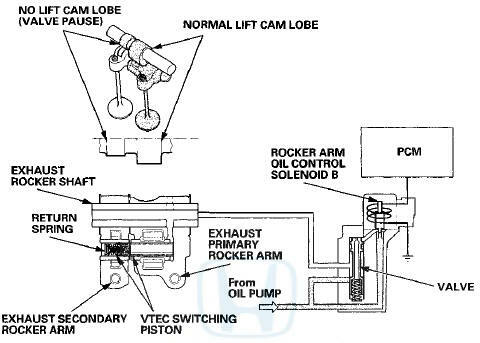 - The rocker arm oil pressure switch (rocker arm oil pressure switch A) detects VTEC system oil pressure (intake valve side) and sends this information to the ECM/PCM. 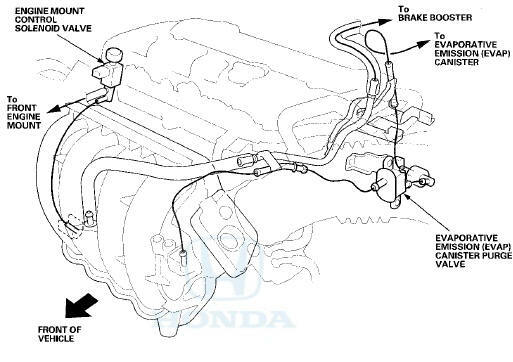 - The VTEC system switches the operation of one of the exhaust valves to pause and lift the valve. - At idle and low engine speed, one side of the exhaust valves is paused, and the valve lifts when the engine speed goes up. - The system reduces hydrocarbons (HC) exhaust emissions at low engine speed. 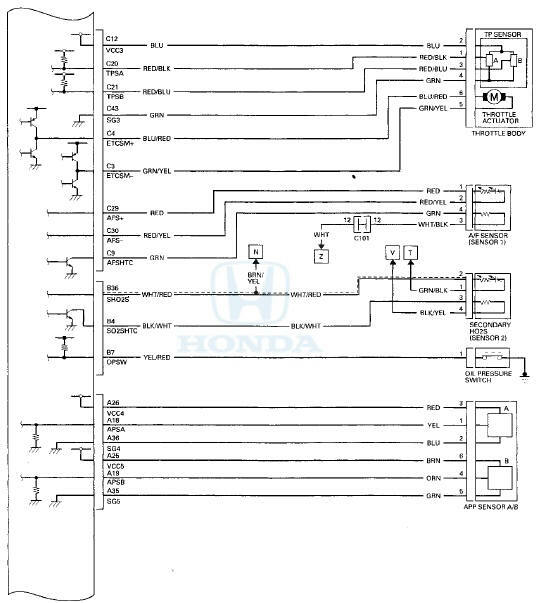 - Rocker arm oil control solenoid B switches the exhaust valve side of the VTEC system on and off; the solenoid is controlled by the PCM. 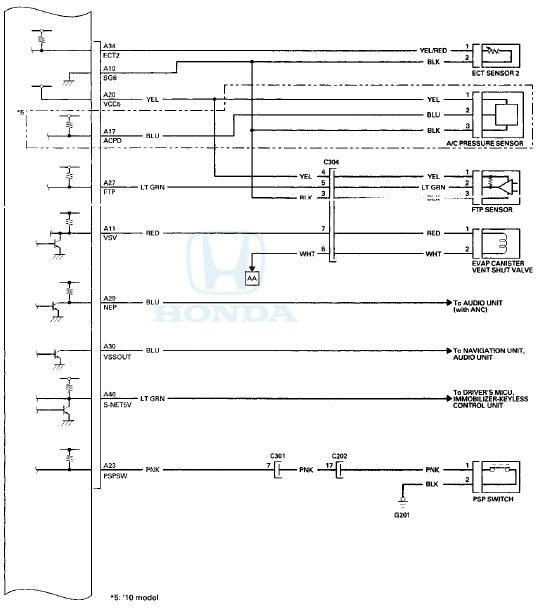 - Rocker arm oil pressure switch B detects the VTEC system oil pressure (exhaust valve side), and sends this information to the PCM. At low engine speed, the rocker arm oil control solenoid (rocker arm oil control solenoid A) is turned off by the ECM/PCM. Oil pressure from the rocker arm oil control valve does not enter the intake rocker shaft. Each intake rocker arm is separated by a return spring and lifted by each low lift cam lobe. At high engine speed, the rocker arm oil control solenoid (rocker arm oil control solenoid A) is turned on by the ECM/PCM. Oil pressure from the rocker arm control solenoid enters the primary intake rocker arm via the intake rocker shaft, and it moves the VTEC switching piston in the rocker arm. This causes the VTEC switching piston to slide into the intake mid rocker arm and the intake secondary rocker arm, locking the rocker arms together. Both intake rocker arms are lifted by the high lift cam lobe. 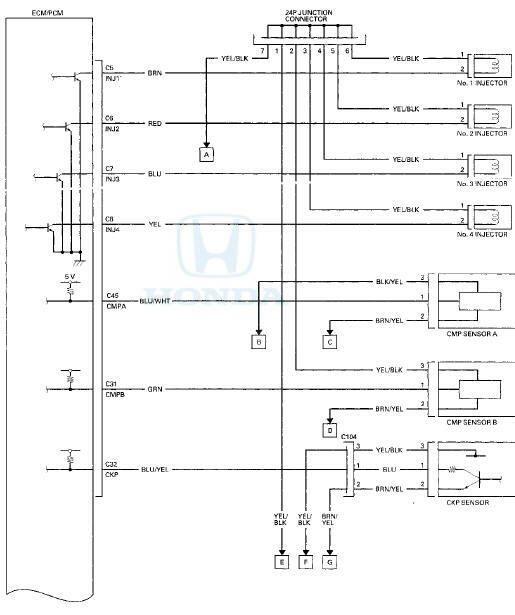 At idle and l ow engine speed, rocker arm oil control solenoid B is turned off by the PCM. Oil pressure f r om the rocker arm oil control valve does not enter the exhaust rocker shaft. Each exhaust rocker arm is separated by a return spring, and lifted by each cam lobe. The exhaust primary rocker arm is moved by the normal lift cam lobe (valve active), and the exhaust secondary rocker arm is moved by the no lift cam lobe (valve pause). 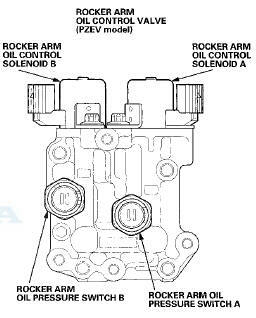 When the engine speed reaches 2,500 rpm or more, rocker arm oil control solenoid B is turned on by the PCM. Oil pressure f r om the rocker arm oil control solenoid enters the primary exhaust rocker arm via the exhaust rocker shaft, and it moves the VTEC switching piston in the rocker arm. This causes the VTEC switching piston to slide into the exhaust secondary rocker arm, locking the exhaust rocker arms together. Both exhaust rocker arms are moved by the normal lift cam lobe (valve active). 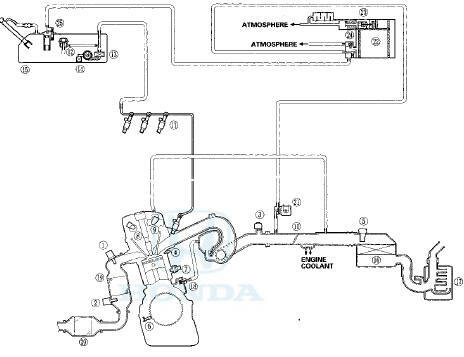 When the engine is cold, if the A/C compressor is on, the transmission is in gear, the brake pedal is pressed, the power steering load is high, orthe alternator is charging, the ECM/PCM controls current to the throttle actuator to maintain the correct idle speed. 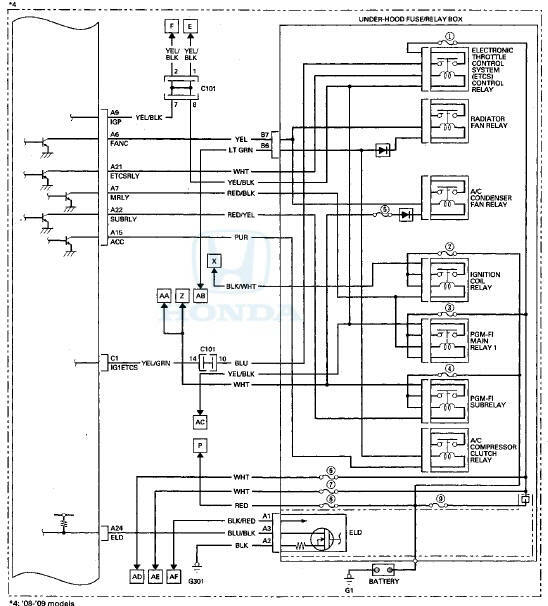 The brake pedal position switch signals the ECM/PCM when the brake pedal is pressed. 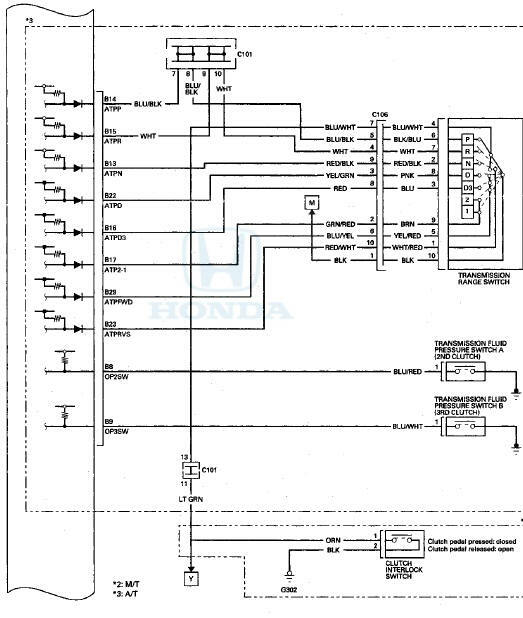 The PSP switch signals the ECM/PCM when the power steering load is high. During deceleration with the throttle valve closed, current to the injectors is cut off to improve fuel economy at engine speeds over 850 rpm (A/T) or 1,000 rpm (M/T). 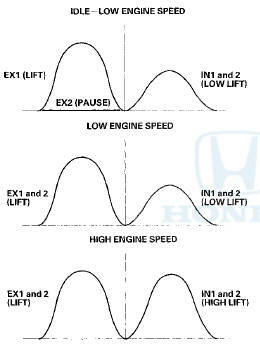 Fuel cutoff also occurs when the engine speed exceeds 7,000 rpm (LX) or 7,300 rpm (EX), regardless of the position of the throttle valve, to protect the engine from over-revving. When the vehicle is stopped, the ECM/PCM cuts the fuel at engine speeds over 5,000 rpm (A/T), 7,000 rpm ('08-09 models LX M/T), or 7,100 rpm ('08-09 models EX M/T), or 4,000 rpm ('10 model M/T). The engine speed of fuel cut is lower on a cold engine. 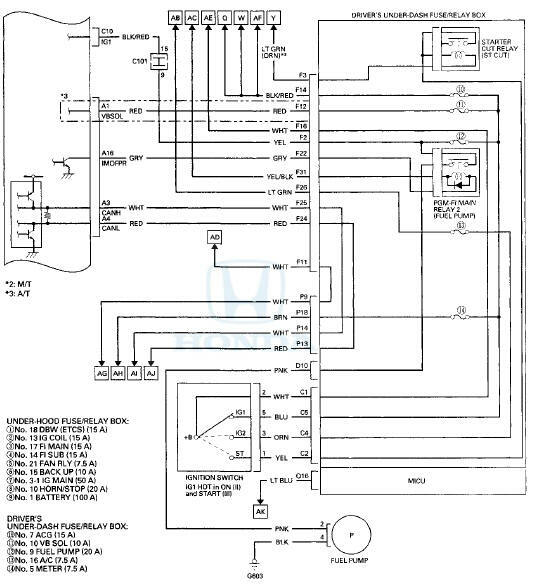 When the ignition switch is turned to ON (II), the ECM/PCM grounds PGM-FI main relay 2 (FUEL PUMP) which feeds current to the fuel pump for 2 seconds to pressurize the fuel system. 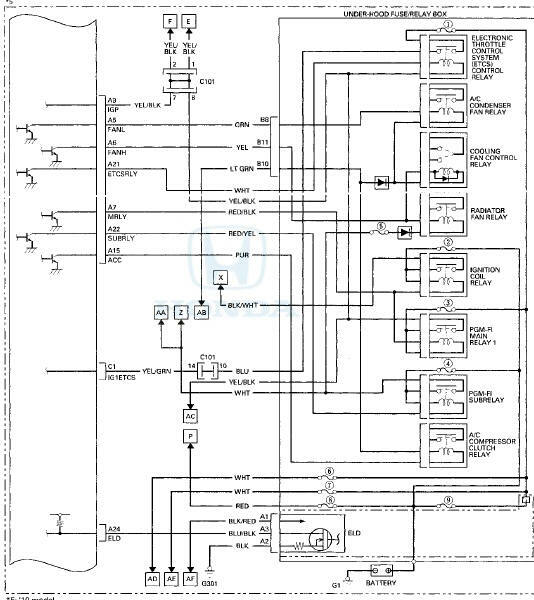 When the engine starts, the ECM/PCM grounds PGM-FI main relay 2 (FUEL PUMP) and feeds current to the fuel pump. 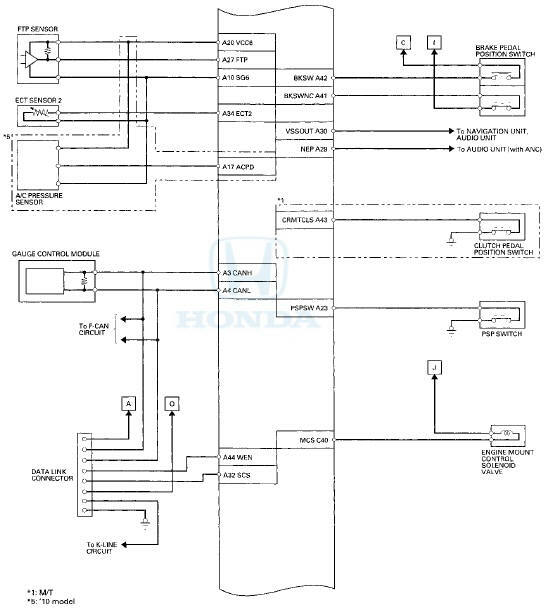 When the engine is not running and the ignition is ON (II), the ECM/PCM cuts ground to PGM-FI main relay 2 (FUEL PUMP) which cuts current to the fuel pump. PGM-FI main relay 1 is energized whenever the ignition switch is ON (II) to supply battery voltage to the ECM/PCM, power to the injectors, and power for PGM-FI main relay 2 (FUEL PUMP). PGM-FI main relay 2 (FUEL PUMP) is energized to supply power to the fuel pump for 2 seconds when the ignition switch is turned to ON (II), and when the engine is cranking or running. The WU-TWC/Under-floor TWC converts hydrocarbons (HQ, carbon monoxide (CO), and oxides of nitrogen (NOx) in the exhaust gas to carbon dioxide (C02), nitrogen (N2), and water vapor. The PCV valve prevents blow-by gasses from escaping into the atmosphere by venting them into the intake manifold. 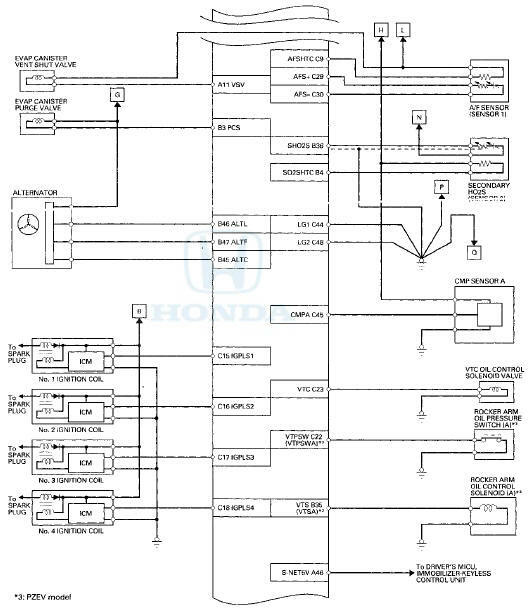 Refer to the system diagram to see a functional layout of the system. The EVAP canister temporarily stores fuel vapor from the fuel tank until it can be purged back into the engine and burned. When the engine coolant temperature is below 131 Р’В°F (55 Р’В°C), the ECM/PCM turns off the EVAP canister purge valve which cuts vacuum to the EVAP canister. The FTP sensor converts fuel tank absolute pressure into an electrical input to the ECM/PCM. The EVAP canister vent shut valve is on the EVAP canister. The EVAP canister vent shut valve controls the venting of the EVAP canister. 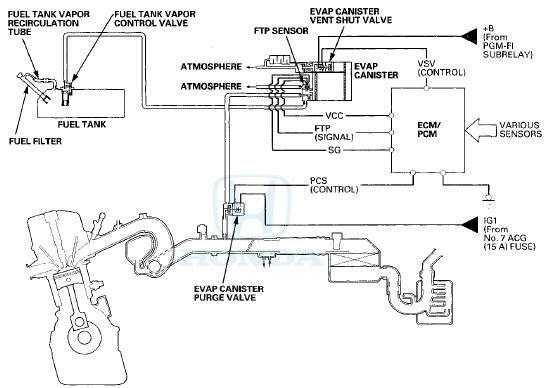 The EVAP controls minimize the amount of fuel vapor escaping to the atmosphere. Vapor from the fuel tank is temporarily stored in the EVAP canister until it can be purged from the canister into the engine and burned. The EVAP canister is purged by drawing fresh air through it and into a port on the intake manifold. 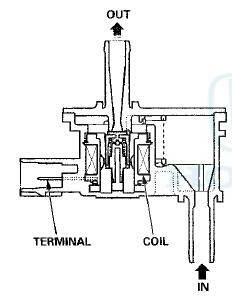 The purging vacuum is controlled by the EVAP canister purge valve, which operates whenever engine coolant temperature is above 131 Р’В°F (55 Р’В°C). The ECM/PCM detects a loose or missing fuel fill cap as an evaporative system leak, and alerts the driver by showing a warning message in the gauge display. 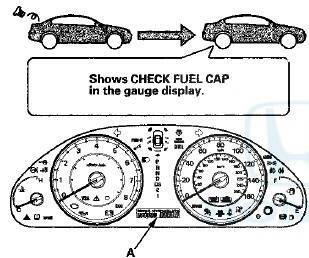 The first time a leak is detected, a CHECK FUEL CAP message appears on the gauge display (A). To scroll to another message, press the select/reset button. The CHECK FUEL CAP message appears each time you restart the engine until the system turns the message off. Turn the engine off, then replace or tighten the fuel fill cap until it clicks at least once. 1. Tighten the fuel fill cap until it clicks. 2. Clear the Pending DTC with the HDS. 3. Verify there is no leak by doing the EVAP FUNCTION TEST in the INSPECTION MENU with the HDS. 2. Start the engine, then turn the ignition switch to LOCK (0).